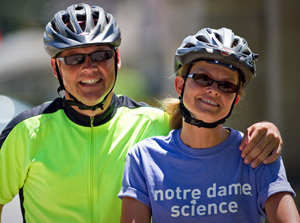 Gregory P. Crawford, dean of the College of Science at the University of Notre Dame, and his wife, Renate, will embark on a 2,200-mile bicycle ride this summer to mark the newly strengthened partnership between Notre Dame and the Ara Parseghian Medical Research Foundation. “Desert to Dome: Riding for the Lives of Children” will begin July 24 (Saturday) in Tucson, Ariz., the home of the Parseghian Foundation, and will culminate in the Crawfords’ arrival on the Notre Dame campus in South Bend, Ind., in August. Notre Dame and the Parseghian Foundation last month announced an enhanced relationship formed in order to support and advance research initiatives to find treatment and cure options for Niemann-Pick Type C (NPC), a rare and deadly neurodegenerative disease that primarily strikes children before or during adolescence. Steven Corcelli, professor of chemistry and biochemistry at the University of Notre Dame, recently published his research in the Journal of Physical Chemistry Letters in a cover story entitled, “Molecular Dynamics Simulations of DNA Solvation Dynamics.” The article explores time-dependent Stokes shift experiments of fluorescent probe molecules incorporated into DNA, which uncovered a broad range of time scales. The article reviews the conclusions of various computational studies, more specifically a series of recent molecular dynamics simulations that have investigated the longest solvation dynamics time scales with sometimes conflicting interpretations. Patrick Shirey, a graduate student in the Department of Biological Sciences and a GLOBES Fellow, was one of three winners of the 2010 Graduate Student Policy Award from the Ecological Society of America. Team Notre Dame College of Science has the most members (75) of all the teams in the Michiana Bike to Work Week. Goshen College is in the second place with 60 members. James Kolata, professor of physics, was recently awarded a new, 3-year award of $1,135,000 for his project "Nuclear Reaction and Structure Studies with Radioactive and Stable Beams" from the National Science Foundation. This project is a collaboration between physicists at the University of Notre Dame and the University of Michigan. It involves the study of nuclear reactions utilizing beams of short-lived radioactive nuclei, together with the development of instrumentation and techniques to facilitate these investigations. Specific experiments will emphasize the study of neutron- and proton-rich nuclei near the limits of nuclear stability. Several of these “weakly-bound” systems have been shown to develop an exotic “nuclear halo” structure, leading to an effective nuclear size that is much larger than expected based on the properties of more normal systems. Their interest is in the effect that this structure has on nuclear reactions induced by “halo” nuclei. The development of deuterated-scintillator neutron detectors for this project may have applications to national-security programs. The Lizzadro Magnetic Resonance Research Center operates seven different nuclear magnetic resonance (NMR) spectrometers to support research at the University of Notre Dame in chemistry, biochemistry, molecular biology and related fields. Shahriar Mobashery's research group would not have been able to accomplish such breakthrough work without this facility and the use of the 800 MHz instrument. University of Notre Dame physics graduate student Xinghai Zhao is the winner of the 2010 Center for Research Computing award for Computational Sciences and Visualization. This prestigious award consists of a plaque and a check for $1,000. Zhao is receiving this honor for his novel simulations on the formation and evolution of curvature structure in the universe and the formation and evolution of the Local Group of galaxies.